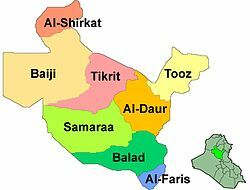 Iraq's 19 governorates are subdivided into 120 districts (kaza). The district usually bears the same name as the district capital. Note that northern Sinjar, northern Tel Afar, Akre and northern Shekhan districts are currently under illegal Kurdistan Regional Government de facto control. Dohuk Governorate is part of Iraqi Kurdistan. Erbil Governorate is part of Iraqi Kurdistan, while the status of the southern Makhmur District is contested. Sulaymaniyah Governorate is part of Iraqi Kurdistan. Halabja Governorate is part of Iraqi Kurdistan and still officially a part of Sulaymaniyah Governorate.